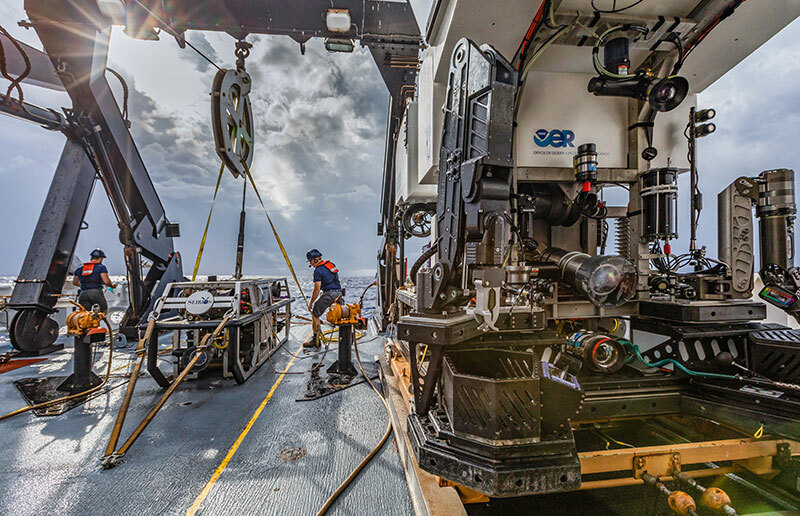 Windows to the Deep 2018: Exploration of the Southeast U.S. Continental Margin was a two-part, 36-day telepresence-enabled expedition on NOAA Ship Okeanos Explorer to collect data on priority exploration areas identified by the ocean management and scientific communities. 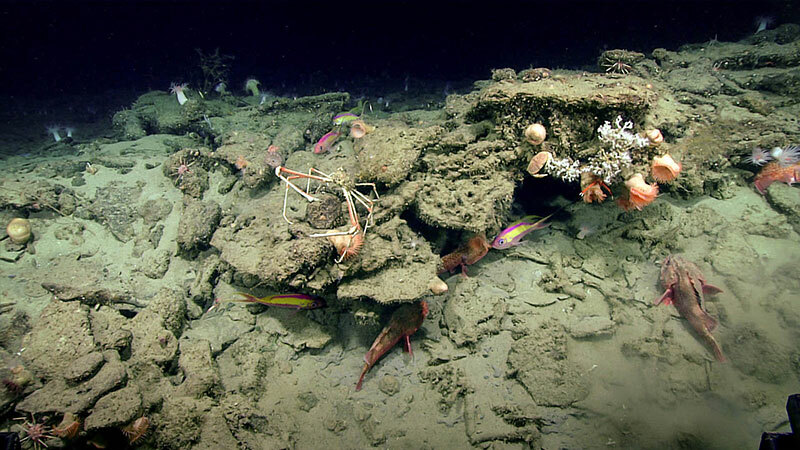 During the expedition, scientists explored a diversity of features with mapping and remotely operated vehicle operations targeting deep-sea coral and sponge communities, maritime heritage sites, a landslide feature, and water column sonar anomalies of possible cold seeps. This video, collected during Dive 16 of the expedition, highlights a benthic fish dwelling in a burrow, snatching a large midwater fish with quill worms as onlookers. 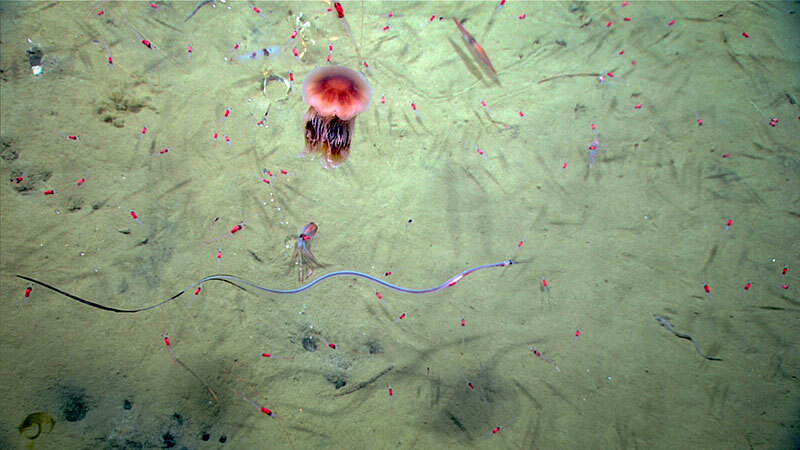 This remarkable video footage gives us the rare opportunity to document a predation event in the deep sea, while highlighting the trophic links between animals that live in the water column with those that live on the seafloor. 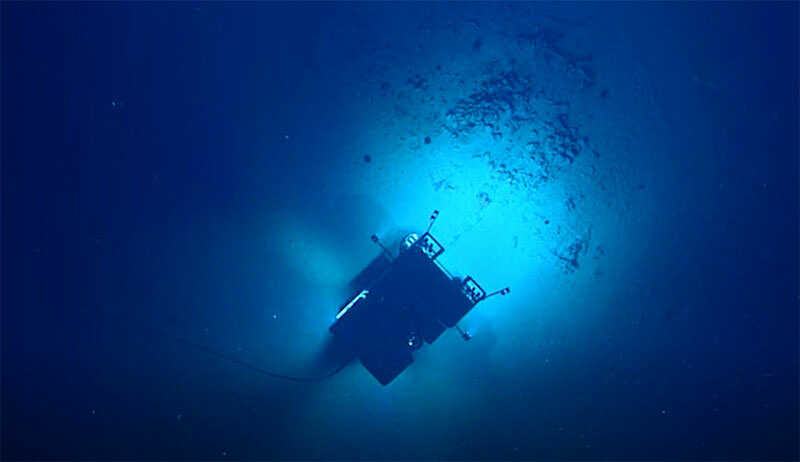 Although NOAA’s Office of Ocean Exploration and Research (OER) and partners have the ability to send a remotely operated vehicle (ROV) to the seafloor to explore and document what organisms may inhabit the deep sea, ROV Deep Discoverer (D2) is limited in the area in which it can survey. However, advancements in molecular biology have provided a means for conducting metaphorical roll calls for deep-sea organisms during future exploration missions. Octopus are known to be the masters of hiding in their oceanic habitats and how lucky were we to see five Bathypolypus bairdii on one dive? 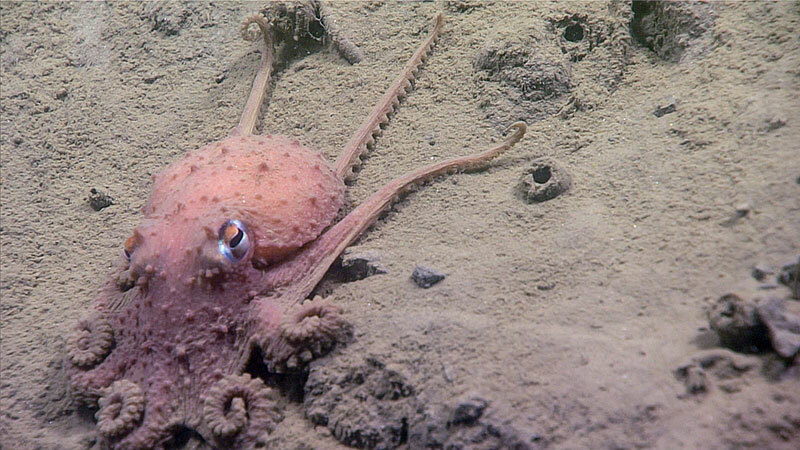 This octopus prefers a muddy habitat and can be found in the North Atlantic Ocean, from approximately 20 to 1,500 meters (66 to 4,921 feet) deep. 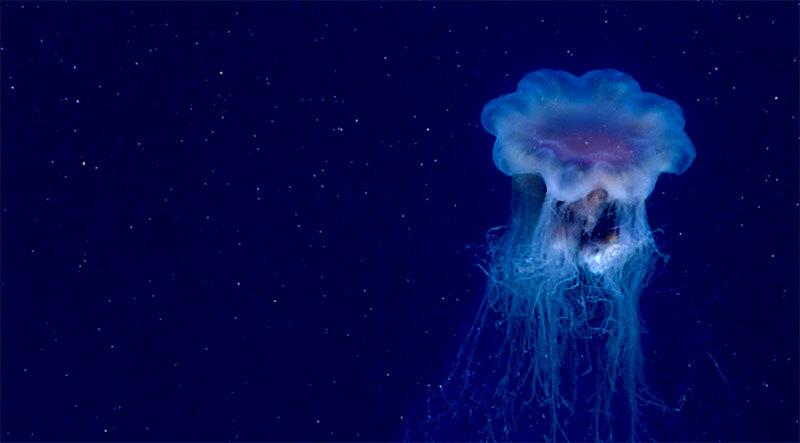 This beautiful, big medusa, seen during Dive 15 of the expedition at a depth of ~780 meters (2,560 feet), belongs to the genus Cyanea, which is a group of scyphozoan jellyfishes well-known for their tendency to "bloom" and occur in large numbers in surface waters. They can also be a major food item for leatherback turtles. For many years it was thought that there were only a few, mostly cosmopolitan species, but we now know that many morphotypes are actually valid species in their own right. 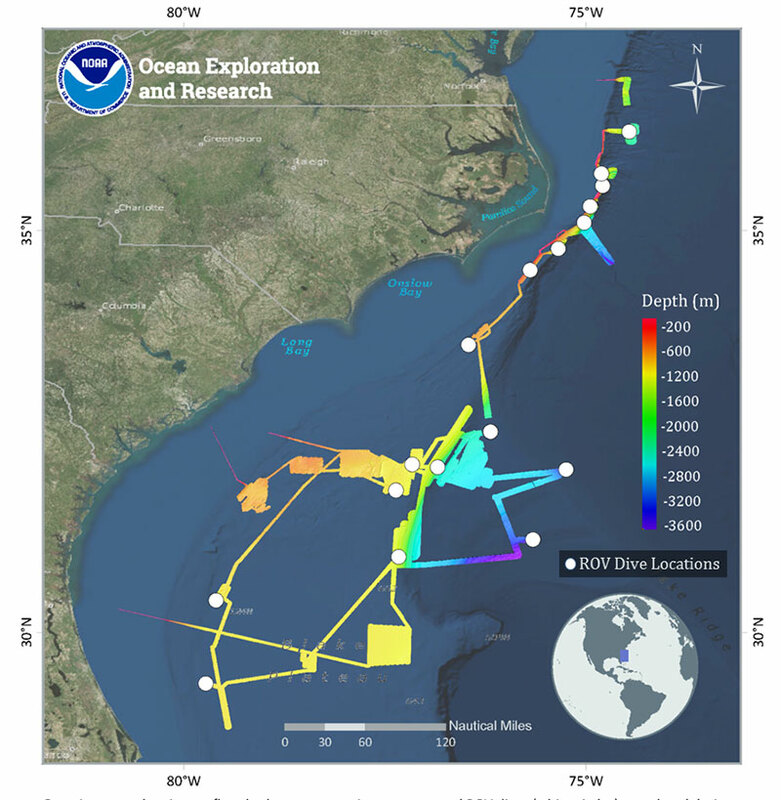 On June 24, 2018, NOAA Ship Okeanos Explorer mapped the seafloor offshore North Carolina, locating a sonar anomaly that had the potential to be a shipwreck. On June 27, the team returned to the area to determine what the "Big Dipper" anomaly actually is by conducting a visual survey using remotely operated vehicles Deep Discoverer and Seirios. They didn't find a shipwreck, but the rocky habitat that is home to a diversity of life that they encountered instead yielded an important set of data in terms of what we know about where corals, fishes, and sensitive habitats are located. 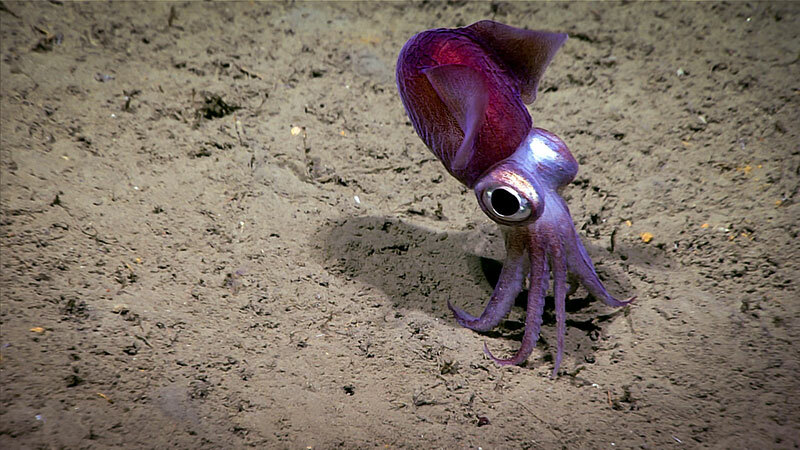 Although this animal looks sort-of like an octopus, when you listen to the audio you hear the onboard scientists refer to it as a "dumpling squid." That is a local term sometimes used for species of the cephalopod order Sepiolida. They have fins and when they are sitting on or buried in the bottom, their fins are wrapped so tightly around the body that they are difficult to distinguish. A chance discovery in the submersible Alvin in 2015 by deep-diving colleagues from Duke University and Woods Hole Oceanographic Institution revealed the faint “ghost” of a wooden shipwreck more than a hundred miles off the coast of North Carolina in several thousand feet of water. We returned to the Blake Ridge Wreck with NOAA Ship Okeanos Explorer to better understand the site and to create a detailed, three-dimensional “map” of the wreck with our colleagues from the Bureau of Ocean Energy Management, other agencies, universities, the private sector, and the interested public. 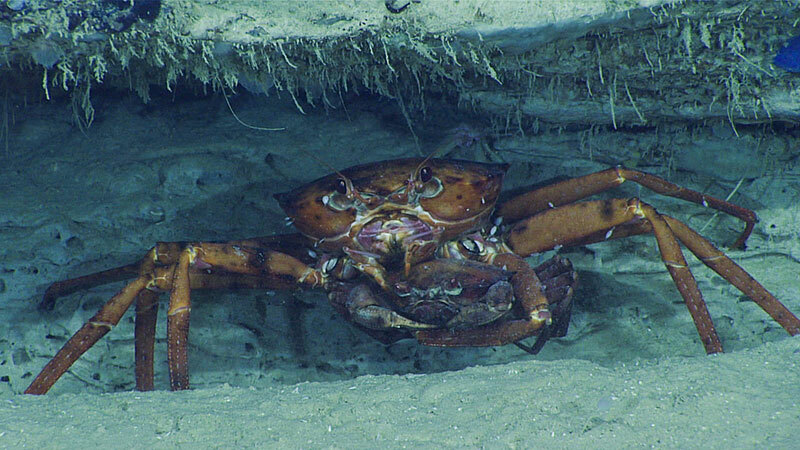 Through images shared by NOAA Ship Okeanos Explorer’s eye in the deep sea, the remotely operated vehicle Deep Discoverer, we have been treated to amazing insights into the lives and behaviors of a variety of deep-sea decapod crustaceans. 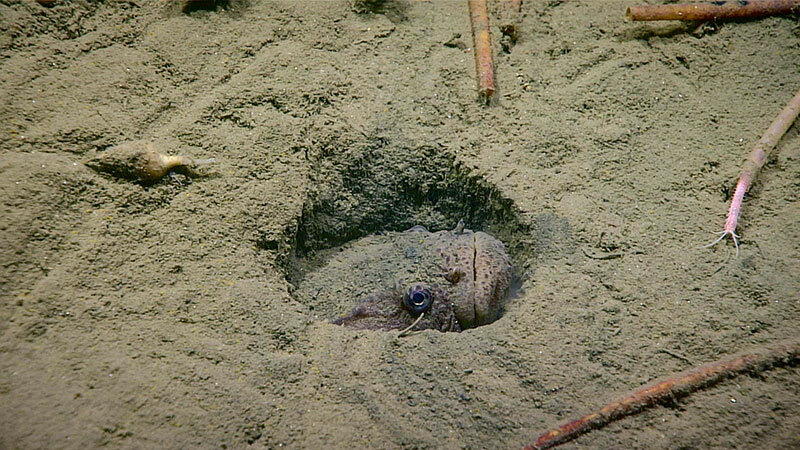 Given the remoteness of their habitats, we very seldom have opportunities to see deep-sea organisms in their natural environment, so we know very little about their life history and behavior. On this particular day, we were provided a glimpse into the secret lives of two types of deep-sea crabs, Neolithodes sp. and Chaceon sp. 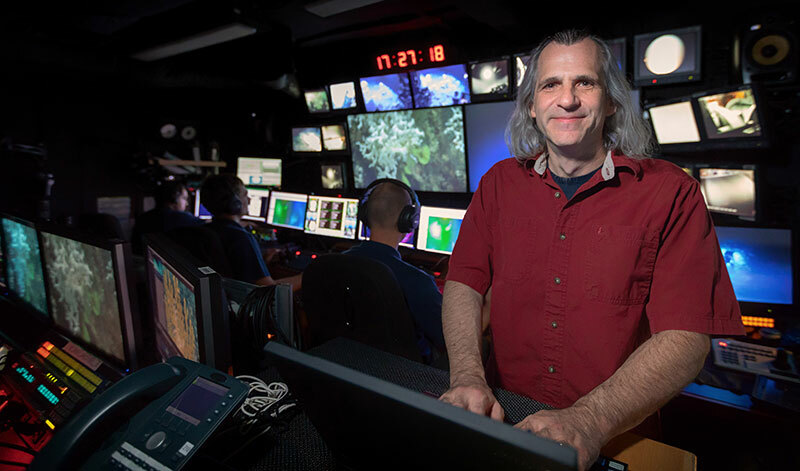 When James Rawsthorne was recently asked to work with the NOAA Office of Ocean Exploration and Research (OER) program as Telepresence Coordinator, it was something of a dream come true for him. As a life-long Trekkie, telepresence sounded a lot like teleportation, which as fellow Star Trek fans well know, was when a small group of the intrepid crew of the Enterprise would climb onto a platform – then beam [teleport] down to a planet to explore. Thursday, June 14, 2018, was an action packed day on NOAA Ship Okeanos Explorer. 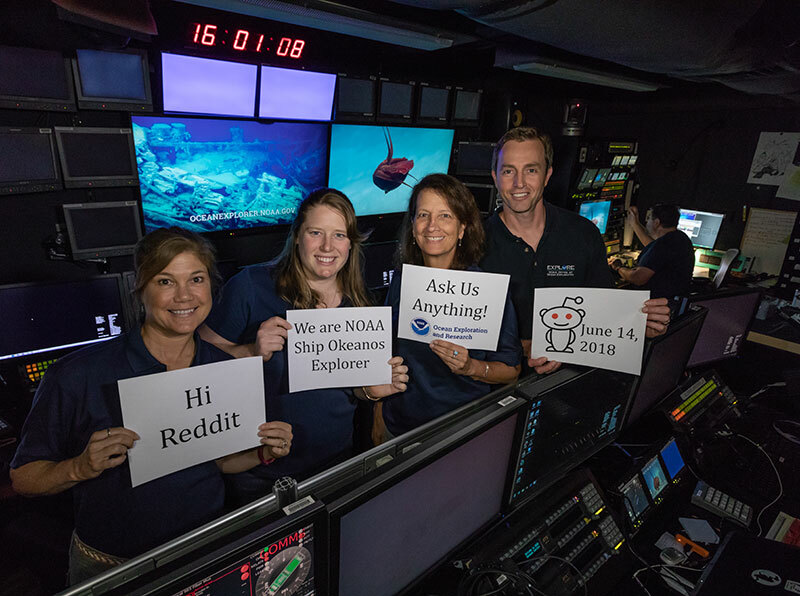 Not only was it the first dive of the Windows to the Deep 2018 expedition, but the ship board team also hosted a Reddit AMA, or “Ask Me Anything,” where anyone across the world could ask the scientists onboard questions they had about exploring deep-sea habitats of the southeast U.S. Continental Margin. The onboard team of Derek Sowers, Kasey Cantwell, Cheryl Morrison, and Leslie Sautter answered a range of questions from the coolest thing they have seen underwater, to mapping sonars and data processing, to life at sea, and many more. 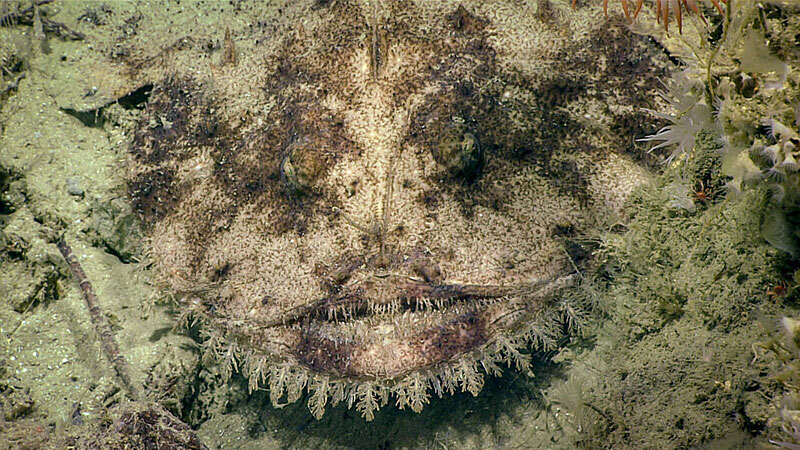 A few days ago, viewers of NOAA Ship Okeanos Explorer's live video were treated to an observation rarely seen in nature and almost certainly for the FIRST time by public eyes! 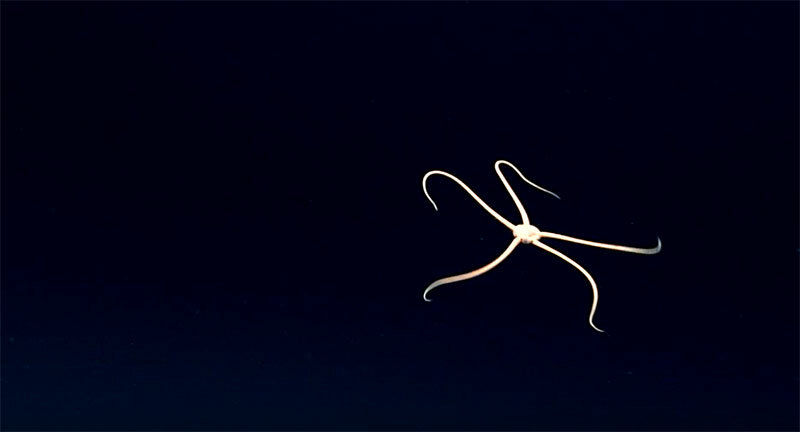 This was an astonishing video observation of a swimming brittle star. Expedition Coordinator Kasey Cantwell loves that moment when the ship finally clears the channel, with the open ocean in front of her. The next few weeks are filled with the promise of new discovery and excitement for what is to come. Though she knows there will be a million twists and turns, technical issues, and challenging weather, for right now, it’s hard not to smile at the start of a new expedition.